MASON, Ohio (AP) - Roger Federer and Andy Roddick overcame minor worries and moved on at the Cincinnati Masters. Andre Agassi dropped out and headed home with a lot on his mind. Federer worked off the rust from a five-week layoff caused by a sore foot, and Roddick compensated for an undependable serve during their first-round wins Monday in the $2.45 million tournament. Agassi came and went without lifting a racket. The 35-year-old defending champion decided to withdraw because a chronic back problem flared up. He hoped that a couple of weeks of rest and perhaps another cortisone shot would soothe an inflamed nerve, allowing him to play in the U.S. Open. Federer needs to sharpen his game after missing so much time. The world's top-ranked player hadn't entered a tournament since winning his third straight Wimbledon title, and it showed. During the first set of a 7-6 (3), 7-5 win over James Blake, Federer set up for a routine backhand and barely touched the ball, which skittered off the tip of his racket. Federer dropped his head in disbelief. Federer didn't get into the flow until the first-set tiebreaker, when he became more aggressive. Blake wasted three break points in the eighth game of the second set, allowing Federer to keep pace. Federer then broke him to go up 6-5, and served it out. Despite the layoff, Federer moved into seventh place Monday for longest stay at No. 1 in the ATP rankings. He has been at the top of the list for 81 weeks, a measure of his staying power. 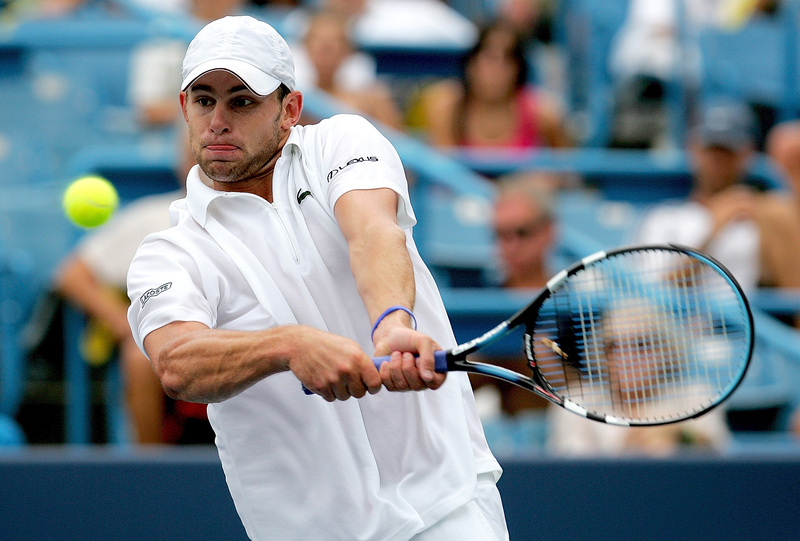 Roddick struggled with his serve, but was solid in every other aspect of a rejuvenating 6-3, 6-4 win over Jurgen Melzer. A week earlier, Roddick was out of sorts during a first-round loss in Montreal, complaining about the brand of ball used for Masters events. The same brand of ball is used in Cincinnati, where Roddick was comfortable with everything but his first serve _ only 56 percent went in. Two seeded players lost in the first round Monday _ No. 14 Ivan Ljubicic and No. 15 Radek Stepanek. Agassi's balky back was a major disappointment in Cincinnati, where he is a fan favorite. He counts his win at Cincinnati last year as a career highlight and a major step in his revival. Agassi's back flared up during a first-round loss at the French Open this year, forcing him to get treatment and miss Wimbledon for the second year in a row. Agassi returned and won the Mercedes-Benz Cup, his first ATP title in nearly a year. The back started bothering him again after he lost a three-set match Sunday in the final at Montreal. He feared that playing another week in Cincinnati would make it worse. ``Ten weeks ago, I didn't know where things were going to go,'' Agassi said. ``I was home during the biggest tournaments of the year. So to be on the court healthy, being able to challenge myself with my game, feels great. Agassi has special feelings for the Open, which he won in 1994 and 1999. Three years ago, he lost to Pete Sampras in a four-set title match that is part of tennis lore. Sampras' record 14th Grand Slam title wound up as his last match before retirement. Agassi has no desire to duplicate Sampras' dramatic send-off _ he hopes to play for a couple more years. ``It would be great to win, but I have no interest in putting a nice little bow around my career and handing it over to anybody,'' Agassi said. ``I'm going to keep giving everything I've got to the sport. It's been so good to me. I couldn't hope or even expect for it to give me any more.